Phew! What a weekend! What a a start to the week! It's been busy, busy, busy around here while the Munchkin and I have been sick, sick, sick. I'm feeling a whole lot better now, just wish I could say the same for the Munchkin. Poor kiddo is so sick, he's just not looking, feeling, or even acting himself at all. I know not being able to go to preschool this week has been killing him cause he keeps asking about his friends. And because we've been sick my game plan of doing some cutting and sewing, and having a mini update for the shop had to be put on hold. Blah! Luckily the weekend was awesome. On Saturday my fabulous friend Liisa made a last minute trip over to the island to attend Jane Richmond's ISLAND book launch party and to surprise our friend Rebecca of nook. We were late arriving at the launch party (which was a success, yay Jane!!) as the Munchkin came down with his first fever right before we were to leave. 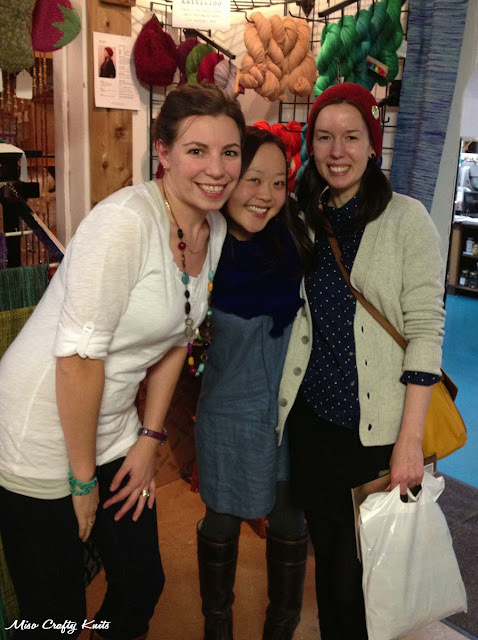 We met some new knitters (and maybe made some new friends? ), Liisa bought some yummy fiber and Jane's book, and of course I didn't take a single photo of the actual event itself. So typical. At the end of the night I did manage to get an iPhone photo of myself with Liisa and Rebecca. Only because 2 other cameras were also in use to take this photo! So thank you Grace (who I just met for the first time in person that night!) for taking this photo!! Do you ever wish you could just spend a lazy Sunday afternoon with good friends chatting over tea and knitting, and maybe a yarn shop visit thrown in too? Me too! I rarely get the chance to do just that, and trust me when I say an unplanned afternoon of that combo is even better! So that's what ended up happening on Sunday. It would have been even more fantastic had I bought yarn during that LYS visit, but I had to use all my willpower to not do so. Instead, I lived through Liisa and Rebecca (who tried their hardest to lure me to the darkside with a skein of MadTosh...evil). Can you believe that? I did not buy yarn. I actually left a yarn shop empty handed! Pigs must be able to fly now! Anyhoo, let's get to the main point of this post. I know we're already halfway through January, and technically it's never too late to set goals for the year. But after some major thinking and debating, I think I've finally settled on my list of goals that I want to accomplish this year. It's a pretty short list, but I can already foresee some possible life changes that could throw a wrench into my game plan and mess up the goals that require much more in-depth planning. So short list it is. And that's it. Of course the ongoing mission to knit more from stash and reduce the amount of skeins going into the stash will always be there in the back of my mind (so much so that I've made myself a spreadsheet earlier this month for my stash!). I figured that was such an obvious one for me that I really didn't need to add it to the list. After all, I seem to always be on a yarn diet of sorts and saying so on the blog. The sewing of more dresses for myself might be the biggest challenge on the list, since all my sewing time is dedicated to project bags. Any extra sewing might take away from my knitting time. But I've been dying to sew up another Tova dress as well as a tunic version (I'm wearing my blue Tova in the photo above), and I bought the Washi dress pattern the day it was released, and I've had both the Chantilly and Ceylon patterns sitting next to my sewing machine for years! I haven't sewn myself a garment in 2 years, I think this is the year that I finally do some selfish sewing! Ok, I think that's it. That's what will be up my sleeve this year. Wish me luck! 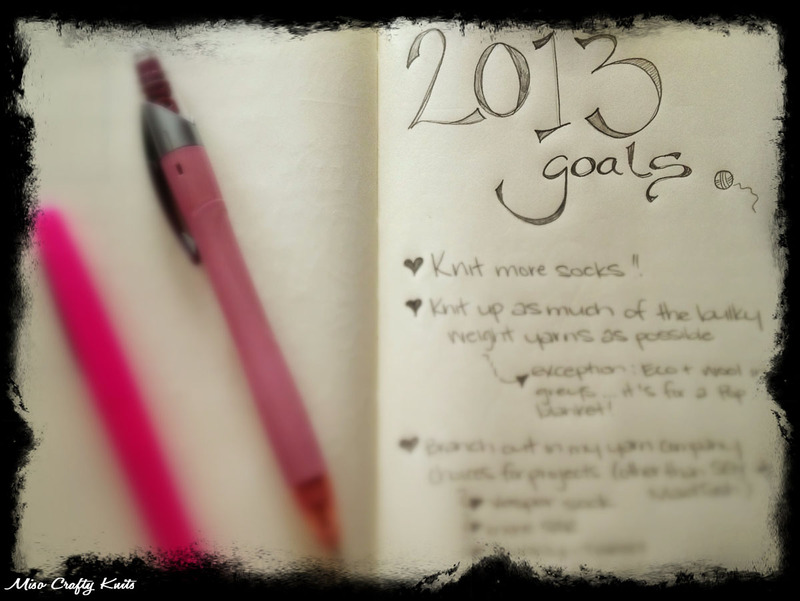 And if anyone has their list of goals for 2013 made, I wish you luck too! ooh I love the washi dress! I want to make one of those too. I have seen some great versions online. I have ceylon sitting in my stash too but I am nervous to make it. Hopefully this will be the year I tackle it. Sounds like your weekend was awesome (with the exception of the sick part) and that you had a fun blogger meet-up. You are lucky to have crafty friends nearby! I’m glad to see you will be aiming for some selfish sewing this year and I think your dress pattern choices are great. Even though I sew all the time, I don’t make nearly enough dresses so I'm also going to aim for a few of those this year, starting with the Chloe dress by Victory Patterns and Colette's Parfait - here's to a year filled with knitting and dresses! Hi Grace!! :) Thanks for stopping by my blog! I hear you! I'm sorely lacking in keeping my Ravelry profile up to date these past few months. Although, I kind of blame the test knits and secret projects for not doing so! But I definitely don't have an excuse as to why my stash page isn't up to date! Thanks so much Ariane for those links! The projects in the GatherHere site...wow! Quite inspirational! Unfortunately perusing that website has made my to-do list even longer! Ack! I definitely plan on sewing up a Washi dress before the year is over, if not before summer rolls around. Good luck with your sewing goals! I know, crazy right?? I hunted down the skirt pattern with much effort! I need to find a friend who likes to sew but not knit/crochet, so I could do a swap! That would be the bomb. Me and sewing have a very standoffish relationship. Haha, oh Linz! :p You're too funny! I love swapping, but totally agree that it's more beneficial to find someone that doesn't already knit/crochet....and for me, who doesn't sew either! I guess I'll stick to my yarn swapping!